Looks good enough to eat! But it's even better. We've put together can't-miss tulips for a big bold display--one that will put the neighborhood's spring spotlight right where it belongs--on your garden. Best of all, it couldn't be simpler. 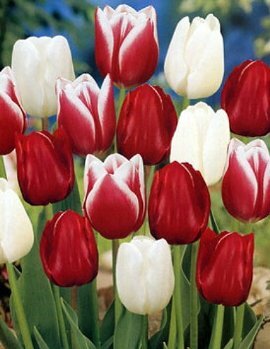 Just plant the bulbs close together, as shown in the photo, and you'll have the same fantastic effect. Hardy Zones 4-9. Color of Bloom: Red & White. Mature Height: 18-20". Months of Bloom: Mid Spring. qty of 1 bag of 10 bulbs.